Did Maverick’s Force the WSL to Pony Up an Estimated $1.4 Million for Pay Equality? Maybe it was the heat or that it likely wasn’t the first time they’d heard the news, but the panel of athletes adjacent to Goldschmidt including Kelly Slater, Carissa Moore, Tatiana Weston-Webb, and Filipe Toledo was at best unphased and at worst underwhelmed. Stephanie Gilmore was the only one beaming. Moore and Weston-Webb flashed smiles. The announcement was historic. It moved Layne Beachley to tears and was lauded by the mainstream press as a monumental achievement in the history of sport. It also speaks to the centuries of progress and a few lifetimes of women taking arrows on the way up to trailblaze their rightful place in professional surfing. It is, objectively, a great development. But just two weeks prior to the announcement, Goldschmidt sat listening to Leah Dawson, Caroline Gleich, and Sachi Cunningham discuss their frustrations with unequal pay in surf and outdoor culture at our EVOLVE Summit in Los Angeles. At that time, WSL insiders told us that calls for equal pay at Maverick’s weren’t financially feasible. But it happened. Across every WSL-controlled event, no less. And it’s been correctly celebrated and encouraged. For that, the WSL deserves its fair share of credit for making a groundbreaking adjustment to its operation and setting a shining example for global sporting organizations. Especially given surfing’s patchy history of marginalizing and objectifying women. But what changed? How did the impossible suddenly become possible? And what was the tipping point? Given the number of conversations we’ve had with athletes and stakeholders for equity in women’s surfing over the last decade (and especially the last year), the announcement could benefit from additional context. 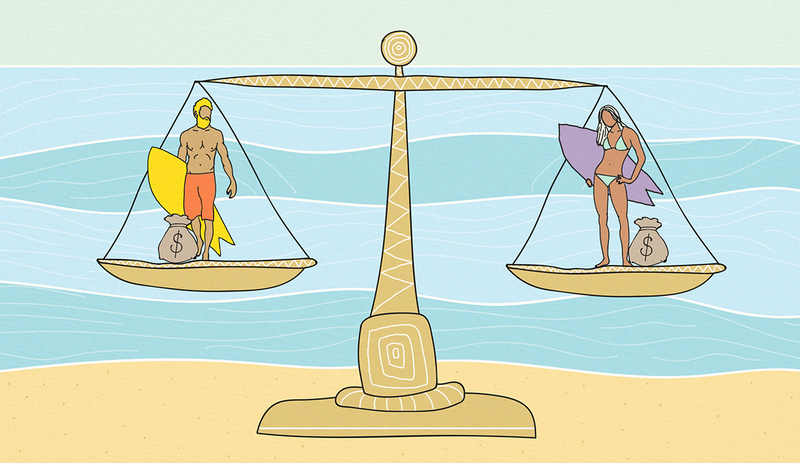 Moreover, given the immediate insistence on setting an example for other sports leagues worldwide, it’s worth examining the actual cost of instituting pay equity in professional surfing and how that compares to other global sports. The last bit of Goldschmidt’s prepared statements hints that the WSL had been cooking up this plan for some time. That the League was always headed in this direction, and that the approximately $1.4 million per year to do so (a number we calculated by identifying the delta between female and male competitors’ prize money across all five tours – as an official WSL spokesperson declined to provide insight into the exact costs required to achieve pay equality) was years in the making. Since Dirk Ziff and company’s acquisition of the WSL (née ASP) in 2013, the League has, in fact, made huge strides investing heavily in women’s surfing, but several major stakeholders say they faced strong opposition in the battle for equal pay until right before the announcement was made earlier this month. But let’s back up. Back in June, the WSL was embroiled in a headline-grabbing scandal where winners of the men’s and women’s under 18 division at the Ballito Pro in South Africa were photographed holding their oversized checks. The women’s winner, Zoe Steyn, received exactly half the winnings of her male counterpart Rio Waida. Mainstream outlets from the Huffington Post to the Guardian glommed on to the news, which quickly became a veritable PR disaster. Spokespersons from the League defended their commitment to a system called “prize purse parity” that led to the curfuffle in the first place. A press release was authored essentially apologizing and explaining this was, “an important topic,” with no clear indication how improvements would be made moving forward. Although, an astute fan might recognize that in the months since far fewer surfers were photographed with their oversized checks. Like zero, actually. In the wake of the Ballito Pro controversy, members of a group called the Committee for Equity in Women’s Surfing pressed the World Surf League to meet and negotiate equal pay (among other things) at the upcoming men’s and women’s Big Wave Tour event at Maverick’s, but WSL executives wouldn’t schedule a meeting. Then, CEWS wrote in a July 9 letter to Renee Ananda of the California Coastal Commission insisting that attempts to pay women anything less than equal prize money at big wave surf contests constituted “gender-based discrimination,” and was therefore against the law. The letter implored the Commission to make equal pay a stipulation for event permitting at Maverick’s. According to Sabrina Brennan, San Mateo County Harbor Commissioner and CEWS member, it was this letter and the fallout from it that led the WSL to schedule a July 23rd meeting in Redwood City. During the meeting between representatives from CEWS including Brennan, Karen Tynan (CEWS’ attorney), Bianca Valenti, and Paige Alms, and WSL CEO Sophie Goldschmidt, Graham Stapelberg, WSL attorney Dylan Budd, WSL Deputy Commissioner and Director of Athlete Development Jessi Miley-Dyer, BWT commissioner Mike Parsons, and others, executives of the World Surf League were emphatic that prize parity would not be feasible at Maverick’s this year. Walking into the meeting, the athletes especially were hopeful, but when it concluded it was a different story. “Bianca and Paige were both really bummed after that meeting,” Brennan told me. Valenti told us that while the meeting’s specifics were hazy, there was one clear takeaway: If equal pay were instituted at Maverick’s then it’d have to be implemented across all five WSL Tours, and the WSL wasn’t prepared to do that. Another professional surfer told The Inertia that after a separate meeting with WSL leadership, consensus yielded that pay equity was simply not possible. When CEWS realized they’d hit a wall with the WSL, they pursued plan B – continuing to lobby permit and lease-granting state agencies with ties to the Maverick’s event to make equal pay for men and women a parameter for a permit. The aforementioned July 9th letter ultimately got the attention of the State Lands Commission, and especially two of its three commissioners – State Controller Betty Yee and Lt. Governor and California gubernatorial candidate Gavin Newsom. It caused the Commission to get on board and express its full-fledged support for equal pay at Maverick’s in a blistering staff report. “The waves do not discriminate,” it read. But in the run-up to an August 23rd meeting of the State Lands Commission, wherein the report and the WSL’s Maverick’s application were on the agenda, the WSL mysteriously pulled their application the night before. Reportedly this was to give the League more time to raise funds for equal pay. Two weeks later, the WSL made its historic announcement: equal pay across categories next year including the Big Wave Tour beginning in October. So what caused the sudden change of heart? According to a spokesperson from the WSL, the move was a long time in the making and a natural next step from the prize purse parity formula instituted back in 2013. When asked specifically if the Maverick’s controversy forced their hand, the WSL didn’t answer the question directly, instead explaining that there have been many advocates for equal prize money over the years. A Small Investment for a Huge Return? While the mechanics of how this change will be instituted are still fuzzy – a WSL spokesperson told The Inertia in an email that everything is still TBD – the WSL assured us there would be no decrease in the men’s prize money to achieve this change in 2019. Some quick and dirty math puts the number of additional funds needed to institute equity at an additional $1.2 million for the Championship Tour, $84,000 for the Big Wave Tour, $78,000 for the Pro Junior, and $17,000 for the Longboard Tour. All told, that’s right in the neighborhood of about $1.4 million. In the wake of the move being lauded as an example for other sports leagues to follow suit, consider these numbers. The highest paid player in the NBA is currently Steph Curry, who makes $34.7 million per year. Salaries in the WNBA top out at $110,000. In other words, to achieve equity in men’s and women’s basketball for a single player, it would cost $34.6 million. Granted, these leagues operate on entirely different scales; the NBA propped up by a global economy featuring the world’s most moneyed organizations. By contrast, surfing rests on a small but expanding number of global brands (to the WSL’s credit) and the generosity of a billionaire, who clearly has a sincere affinity for the power of surfing. But even in surf, $1.4 million isn’t especially significant. It’s approximately .03 percent of WSL co-owner Dirk Ziff’s $4.8 billion net worth. This is complete speculation, but that’s probably a fraction of the value of any single position in Ziff’s investment portfolio. For reference, the estimated cost of establishing pay equity for women in professional surfing – the cost for the sport to become a torchbearer for all global sports – represents less than one half of Dane Reynold’s contract with Quiksilver from 2011 on, which netted him $3.5 million per year. And an even smaller fraction of John John Florence’s 2017 annual combined income among sponsors of $5.7 million. The cost of establishing equity in our sport breaks down to about 25 percent of JJF’s annual take-home pay. Suffice to say, few global sports organizations have the luxury of such low overhead. What’s more, the result of the announcement was a form of advertising the likes of which the WSL could not have dreamed – major outlets everywhere picked up on the “first U.S.-based sports league to institute pay equality” talking point. If that money were headed to an ad spend on Facebook for Q3 and Q4, it wouldn’t have had nearly the impact. In short, there is a strong business case for this decision. One WSL officials acknowledged as a sound investment in emails to The Inertia. Maybe that’s cynical. But (estimated) numbers don’t lie, and that’s not necessarily a bad thing. That means it will continue. There is an incentive beyond altruism and a belief in human rights. To the WSL’s credit, when backed into a corner with Maverick’s, there were alternate options available to them. The League could have pulled the plug on the event entirely, or instituted equal pay at Maverick’s but nowhere else. Equal pay across categories requires more coordination and a larger, sustained financial investment than either of those options. And to that question, there are two potential answers. The first is that raising an additional $1.4 million per year is, in fact, a difficult prospect for a league endeavoring to professionalize a niche sport. The second possibility is that with noses so close to the painting, it was too difficult for WSL execs to see the bigger picture – a perfect opportunity to be celebrated for moving the needle in sport just a little further. It’s unclear which is more troubling. The end result is a positive one, to be sure. The future is brighter for young girls hoping to make a living as professional surfers some day. And the gesture is substantial – a monumental shift, potentially a tipping point for all sports to follow. Still, it’s important to contextualize this development and acknowledge at least some of those on the periphery who fought tooth and nail to make this announcement a reality, and no doubt will continue to fight for the betterment of our sport for decades to come.